Myth No 1: The Paris Agreement will limit the rise in average global temperature to between 1.5 to 2 degrees this century. Truth No 1: The Paris Agreement will lead us to a world with a three degree increase in global temperature this century. This is more than 50% above the target of 2 degrees and 100% more than the 1.5 degree target. What other programme in the world would be considered a success when it fails to meet its targets by 50 – 100 %? The majority of developing countries, including Nicaragua, support the goal of limiting the rise in average global temperature to 1.5 degrees this century. The majority of developed countries support the target of two degrees centigrade. Myth No 2: The Paris COP-21 Meetings and Agreement have been honest and transparent. In preparation for COP-21, countries agreed to submit documents outlining their Intended Nationally Determined Contributions (INDCs) post-2020 as their commitment to collective action toward a low-carbon, climate-resilient future. To keep average global temperature rise under 2 degrees centigrade with regard to preindustrial levels, would require a reduction in emissions to 40 gigatonnes of greenhouse gases. However, according to INDCs submitted, emissions of greenhouse gases in 2030 would lead to a projected 55 gigatonnes. This is likely to mean a rise in average temperatures of between 2.7 and 3.5 degrees centigrade. Because of Nicaragua’s insistence, the fact that the current INDCs will lead to 55 gigatonnes of emissions by 2030 was included in the document. But the document did not show that this means a 3 degree centigrade rise in average temperature this century. The omission of this fact illustrates the seriousness of the failure to address the magnitude of the challenge. The use of voluntary mechanisms of the INDCs, in an environment of weak political commitment, has also helped to bring about the enormous failure to meet targets. Myth No 3: The great achievement of the COP-21 is that the INDCs of more than 147 countries are based on the principle of universal responsibilities. Truth No 3: The INDCs are based on the principle that “we are all responsible for climate change and we all have to contribute to the solution.” This means there is no apportioning of blame. COP-21 invented the concept of universal responsibilities to nullify the concepts of “historic responsibilities” and “common but differentiated responsibilities” (CBDR), the hallmark of the UN Convention on Climate Change. In this way COP-21 has destroyed what was left of the Convention. Logic shows us that the only way to resolve the problem of current and future emissions is to reach targets based on the concept of “historic responsibilities”. The three largest producers of greenhouse gases are responsible for 48% of global emissions. The top 10% of countries represent 72% and the top 20% of countries represent 78% of global emissions. The same countries also represent 76% of global GNP. This indicates that the countries that cause the majority of emissions have the ability to solve this because they also have the necessary economic resources. The 100 countries with the least emissions represent only 3% of global emissions. In order to limit global warming to 2 degrees, it is obvious that the biggest reduction must come from those who produce the most greenhouses emissions, especially the 10 largest emitters. INDCs based on voluntary “universal responsibilities” will be a failure. The only solution is to have a quota system based on historic responsibilities and obligatory common◦ but differentiated responsibilities. Myth No 4: The COP-21 Summit and the approval of the Paris agreement took place within the framework of a democratic process with open to participation by all parties. Truth No 4: The Presidency closed COP-21 with an anti-procedural dictate, and with substantial neo-colonial impositions, explained as an alleged “typographical error”; this was an abuse of all developing countries and of multilateralism. For the most part, the process of preparatory meetings was accompanied by consultations, and updated versions of the document incorporating elements of these consultations. However, in the final session, the COP presidency reverted to the anti-democratic imposition that has been the Modus Operandi of various other such conferences. It was more important to save the face of the Presidency, keep the support of the second-largest emitter, and give the impression of “the success” of the meeting, than stop climate change and global warming, and save Mother Earth and humanity. The negotiating groups of developing countries (G-77 + China, “Like Minded countries”, and ALBA), were committed to carrying out the Paris Agreement within the Framework Convention, respecting the principle of common but differentiated responsibilities (CBDR). The United States, on the other hand, had been clear that it could accept a legally binding document, but with the exception of the sections on emissions and funding; in other words, all except the two most important elements. The weakening of the wording crossed the red negotiating line of developing countries: the principle of common but differentiated responsibilities. Some developing countries, after identifying the grave implication of this change in the text, were ready to express their disagreement once the French Presidency opened the floor for interventions. However, he then went on to declare the document adopted without listening to requests from various countries thereby abusing the rights of Nicaragua and other countries. After this unexpected blow, Nicaragua clarified that it “never considered blocking the document, but only made concrete suggestions to improve it, and to announce that it would not submit an INDC because it refused to be complicit in the deaths, losses, damage and destruction that a world three degrees warmer will represent”. Nicaragua could not accept a document that does not include a compensation mechanism from countries that have caused climate change to countries that have suffered the consequences. Therefore, the Warsaw International Mechanism for Loss and Damage is effectively nullified. Truth No 5: On 1 October 1st 2015, the Vice President of Nicaragua, Omar Halleslevens, read a message from the President Daniel Ortega Saavedra, at the UN General Assembly. 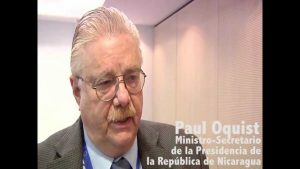 Nicaragua hoped that, from COP-21, would come a compensation mechanism for the countries that are suffering year on year from the deaths, damages and losses caused by climate change. The countries with the historic responsibilities for having caused the problem must compensate those countries that are suffering the consequences despite having had no role in their creation. Multiple times, Nicaragua introduced a clause to this effect in the Paris Agreement, whilst the co-facilitators, with equal persistence, removed it due to opposition from developed countries, especially the United States. On the other hand, the United States played three roles in the negotiation of loss and damage. First, it supported the Small Island States and the Least Developed Countries in the hope of maintaining a monopoly over the status of highly vulnerable countries. Since the Cancún climate change summit in 2010, the US has opposed considering Central America a highly vulnerable zone, despite the fact that science demonstrates this vulnerability year on year. Central America believes that this cannot be a closed category, and that with the advance of climate change to more and more regions, more and more countries will be included in this group, eventually practically every country in the world. It believes that today Central America, South Asia and South East Asia must be classified as highly vulnerable regions, in addition to those already included. A world three degrees warmer is prescribed for our grandchildren, great-grandchildren and great-great grandchildren, due to developed countries’ low level of ambition for reduction. And to top it all, compensation rights are refused. Intergenerational solidarity ended in Paris. Has there been a more unilateral and unbalanced multilateral agreement this century? MYTH 6: APPROVAL IS BY CONSENSUS AND IT WILL COME INTO FORCE AFTER RATIFICATION BY A QUORUM OF COUNTRIES. Truth No 6: We are being led to believe that there will be a massive ratification of the Paris Agreement as a necessary element of its legitimisation. The relevant Article specifies that the Accord will come into force 30 days after ratification by 55 countries, which must also account for 50% of the emissions. The number of countries required for bringing the Agreement into force is very small (55 out of 194) but the quantity of emissions is very high (50%), which guarantees control of the ratification process by the developed countries. MYTH 7: THE PARIS AGREEMENT IS NOT ENOUGH BY ITSELF BUT IT OPENS THE WAY TO DEALING WITH CLIMATE CHANGE IN DUE COURSE. Truth No 7: The Paris outcome is similar to the rescue by governments of the banks which caused the financial and economic crisis, passing the bill for the crisis on to workers, pensioners and taxpayers. In Paris, the rescue was of the COP-21 governments of the countries which have caused global warming, passing the cost to those least responsible who will die in the largest numbers unable to make good their losses, much less adapt to a change in climate increasing in intensity as the century wears on. The Paris Agreement is not enough because it does not transform nor even inconvenience the current model of production, consumption, finance and lifestyle, which is unsustainable. After Paris, the stock markets of the world yawned. They foresaw no impact on the anti-values which drive limitless, endless and senseless accumulation and consumption. The Paris agreement does not solve problems but simply postpones them. It also reduces the pressure on the model by being voluntary and having mandatory targets that fluctuate according to the results of the Intended Nationally Determined Contributions (INDCs) exercise every 5 years.